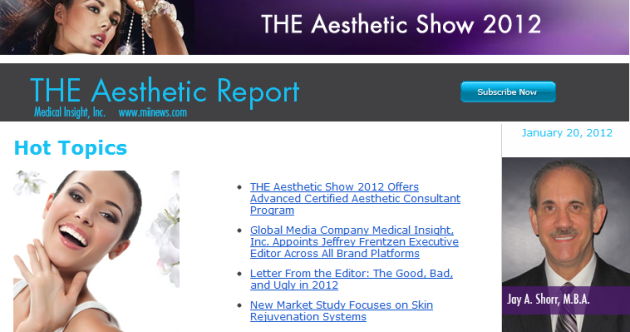 Quite a number of readers alerted me to the fact that THE Aesthetic Report is blatantly stealing content from Medical Spa MD and other sites and publishing it as their own. I've never had any real contact with THE Aesthetic Show or THE Aesthetic Report (both are owned by Medical Insight Inc.) but this is quite obviously theft of content from our site and presumably others as well since NONE of the articles in the email were written by them. They were all taken from someone else. To add insult to injury, these guys post the content that they steal as '© 2012 Medical Insight, Inc. | All rights reserved'. Nice. Here's the email that I received linking to the Medical Spa MD article that they posted on their site. Here's the stolen article they posted on their own site. 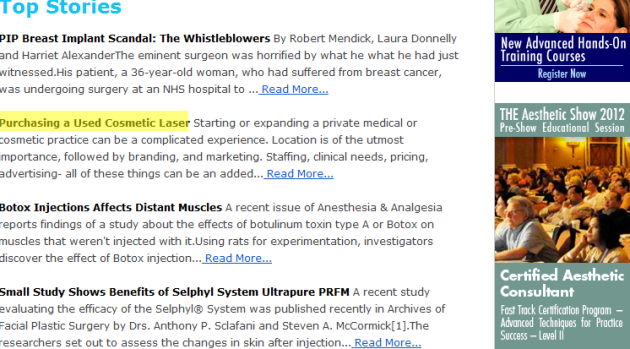 So why am I pissed since they put a 'Source: Medical Spa MD' at the bottom of the article? Look, these guys are stealing content from others in order to entice you to sign up to their email list. They don't add any value or offer anything in exchange. They don't ask. They just steal it and then they put a link back to to the original content right at the end with a sucky little 'here' link. It's sleazy. It's plagiarism. It's illegal. AND it's insulting. What would have been acceptable is if they would have asked nicely first, or just posted a single paragraph with a keyword link wich is certainly acceptable, but of course they didn't do that because they want everyone to think that they have permission and that this is their content. Of course THE Aesthetic Report is doing this so that they can send out their marketing emails under the guise of actually offering something of value. Too bad that they had to steal it rather than just ask.